Butcher Apron Custom Personalized in Bulk or Blank. Very Inexpensive, Promotional. Optional full color imprint. Lowest prices in the USA and Canada. 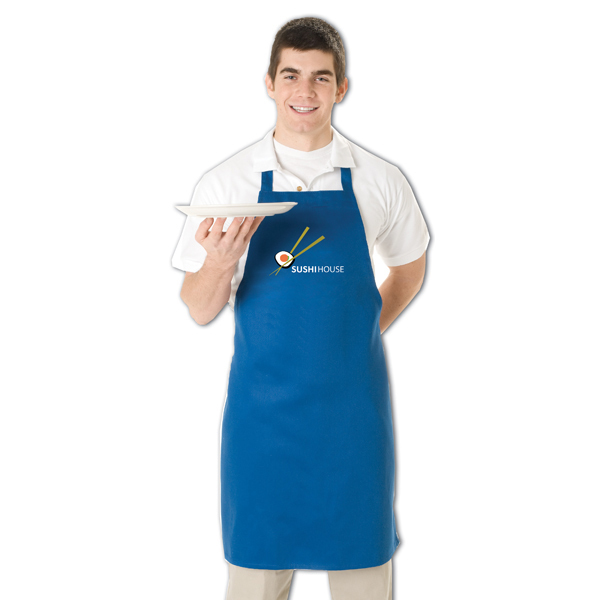 Advertising Butcher Apron customized in bulk in up to full color. Budget Prices in North America. Free Artwork Design and Secure Online Ordering. American Clients pay no taxes. The unit prices below include your 1-color custom silk-screen imprint on one side. We also supply blank (not personalized) Butcher Apron at 80% of the EQP (End Quantity Price). Butcher Apron: 7.5 Oz. Twill fabric, full length with plain front. Generous cut, self-fabric neck strap. Extra-long waist ties can wrap around and tie in front. Cotton/Poly. Wide Bib for large printing area. As low as $4.97 per blank (not imprinted) apron! Imprint Area: 10" x 14"